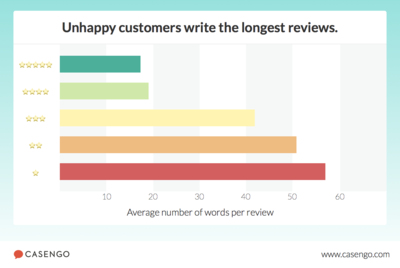 Unhappy customers often take the trouble to share their experiences with others, possibly hoping that the disappointing company learns from the feedback: negative reviews are longer and more detailed. So what do these reviews tell us? 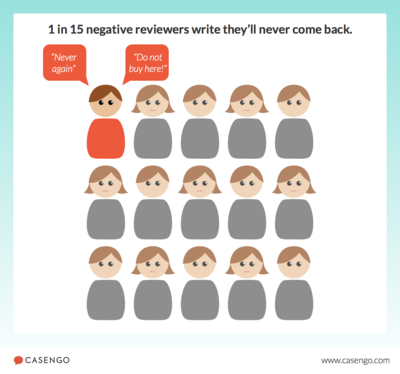 Casengo, champion of better customer service online, analysed over 46,000 negative customer reviews and poured the results into an infographic. 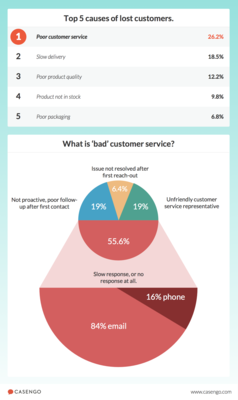 Almost 1 in 5 complainers mention bad customer service and/or slow delivery. But the former beats the latter: of the 1 in 15 complainers who explicitly write never again to buy from the company in question, a quarter call bad customer service the key reason to stay away forever. Consumers aren’t pleased about slow delivery, but bad communication is the last straw. So what do complainers mean by ‘bad’ service? Online shops that fail to respond swiftly (or at all!) to customer emails know all about it. Slow follow-up after the first contact also causes annoyance. 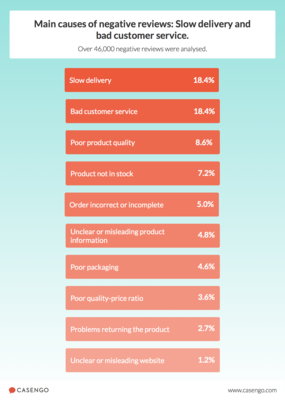 Logistical blunders happen more often than you would expect: almost 10% of ex-customers had to cope with the fact that the ordered – and often paid-for – item was not in stock after all. Casengo analysed a sample of over 22,000 online shops to learn more about the influence of external review platforms. It turns out that online shops with a high customer satisfaction rate – nearly a quarter of the sample – enjoy posting their external customer reviews on their websites, using a widget. 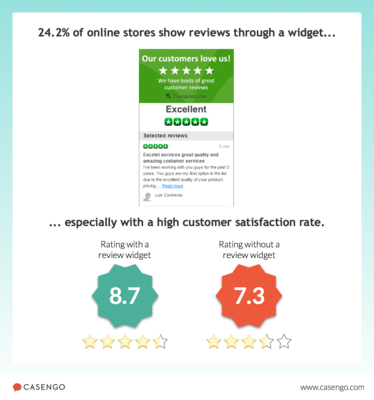 Their customers rate them 8.7 out of 10, whereas onlines stores without a widget get a meagre score of 7.3.